Here are some of my FAVE BLOGGING RESOURCES! I would be nothing without these. Just FYI, I may get a few pennies thrown at me if you purchase something from these links. I only endorse products that I use and love. First up, Food Blogger Pro. Far and above the single most helpful resource in building, growing, and sustaining a food blog. 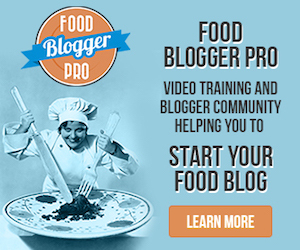 Not only do you gain access to step by step training videos, but you also become part of an enlightened community of over 800+ food bloggers looking to connect and grow with you. Bluehost.com. If you are looking to host your site for only pennies a day, Bluehost is for you. Not only is Bluehost incredibly user friendly for novice bloggers, but it also doesn’t cost more than you are bringing in from your blog. WIN! Tasty Food Photography E-book from Pinch of Yum. This was one of the first things I purchased when I got serious about this here bloggie. Lindsay’s teaching style is SO easy to follow. After just one lesson, I immediately noticed a difference in my photos. How to Monetize your Food Blog from Kiersten Frase, the amazing lady behind OhMyVeggies. I STILL go back to this e-book and read some of the monetizing tips! Learn all about ads, affiliate programs, sponsored posts, working with brands, selling products, using your blog as a portfolio, tracking income, and paying taxes. She’s also got a snazzy DIY media kit template for only 5 bucks! Click here to view more details! 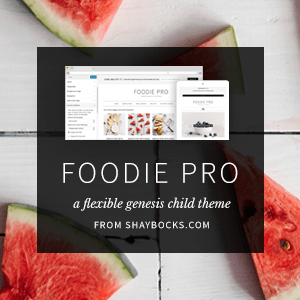 Foodie Pro Theme by Shaybocks. This theme is BEAUTIFUL! So clean, streamlined, and user friendly. The most awesome thing about this theme? A recipe page is BUILT IN! Available on the Genesis Framework.